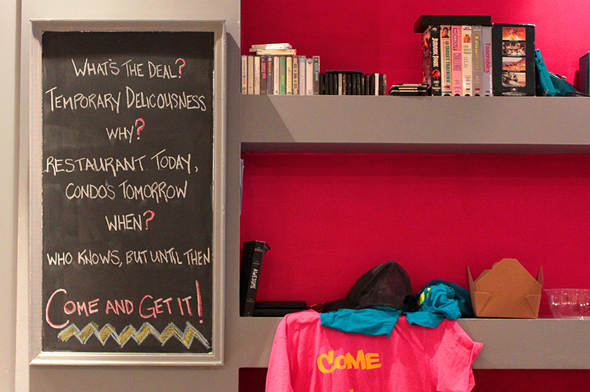 Come and Get It is the latest pop up to throw its hat into the "here today, gone tomorrow" restaurant scene. 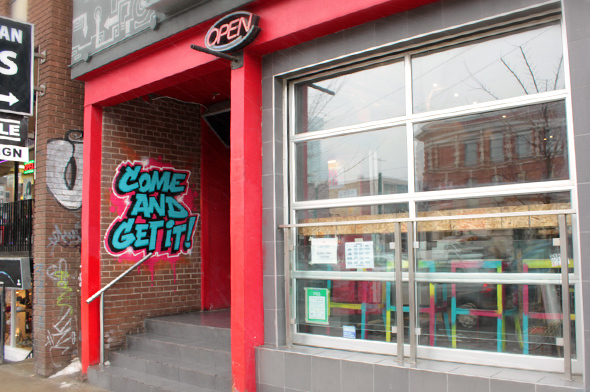 Located at Queen and Spadina, "Get it" is temporally squatting in the former Ackee Tree space that's slated for — surprise! — a new condo development called FAD. When asked about how long the restaurant will likely have to operate, staff confessed that the timeline is very much up in the air. But, lucky for us, the condoization process doesn't literally happen over night (though it might seem that way), because this spot is fun and tasty with a unique personality. The space may be something of an assault on the senses for some but I found the interior playful with its energizing fuchsia walls and the '90s era nostalgia peppered throughout (think of an iMac G3, Nintendo 64 and Simpsons lunch boxes). The decor doesn't, however, come across as some sort of gimmick that you'd find at a corporate spot or as some trend that's run amok. They're pandering to a certain demo they know all too well —Â themselves. Given that the place is usually packed, we stopped by on our lunch break in the hopes of avoiding a wait. The well-selected and simple menu offers four options prepared three ways. Chipotle short ribs, Hawaiian pork belly, granny smith Caesar chicken and herbed green beans come as either a sandwich, salad or poutine. 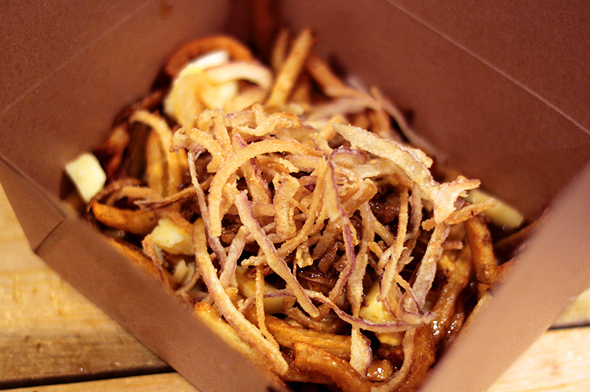 We went for the pork belly sandwich and short ribs poutine. 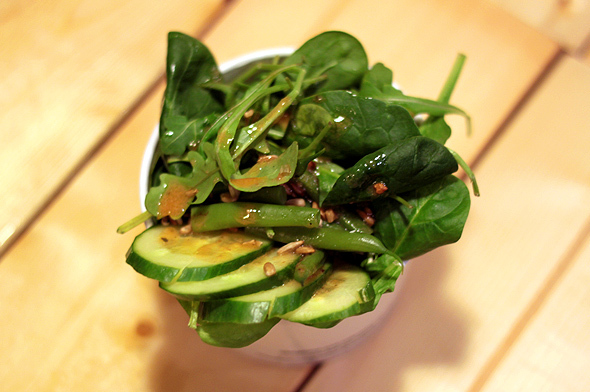 Within five minutes of ordering, our food arrived in biodegradable take out containers — yes, that fast. On this day we actually had enough time to enjoy our lunch away from the office, so we took a seat at one of the communal picnic tables. They nailed the short ribs. Melt-in-your-mouth! The dish has the perfect ratio of topping to fries, and the crispy fried onions offer an added shot of sweetness that enhances the gravy. Although it wasn't missed, we couldn't taste much by way of heat from the chipotle. Still, given how good it was, I wondered if it wouldn't have been even better in sandwich form. 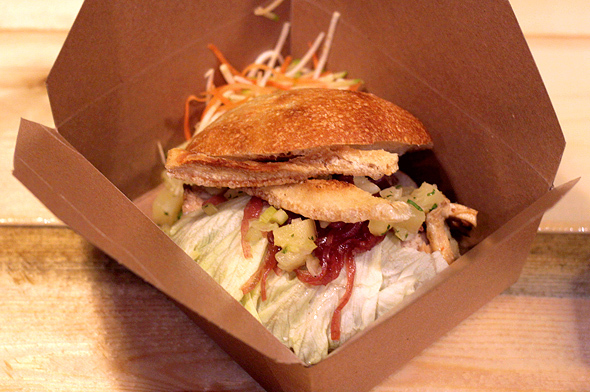 The pork belly sandwich, which comes with a sweet and sour slaw, features bits of crackling that adds the necessary crunch when the iceberg lettuce inevitably wilts a touch. Between the hoisin sauce and pineapple salsa, it's a bit on the sweet side, but both the slaw and our side salad adds the requisite tartness to balance everything out. The pork itself is delicious with a hint of five spice that adds some welcome depth. 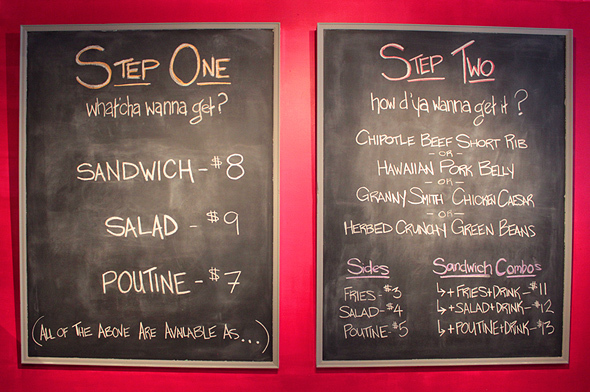 Come and Get It is taking a new approach to the lunch rush in the Entertainment District. They're having fun, and it shows. Given that the review process for the condo development hasn't even started yet, the window of opportunity to try it may last into the summer. But, better safe than sorry, as the proverbial dinner bell is a ringin'.